Tight deadlines. Sky-high executive expectations. Regulatory compliance. Near-constant pressure from above and below. A typical day for a product manager involves juggling these things, knowing answers, and above all, maintaining a rosy disposition in the face of immense frustrations. Over time, the combination of these stressors can overwhelm and induce exhaustion, but it’s not an inevitable condition. With a new year upon us and the rapidly increasing complexity of new innovations, product managers can help themselves (and, by extension, their teams) by remembering some basic guidelines and good-sense strategies to ensure day-to-day demands doesn’t snowball into burnout. Especially in complex development projects, it can be easy for a product manager to get lost in the thicket of expectations and deadlines. Zooming out and revisiting the project’s initial goals can offer some much-needed perspective and serve as a helpful reminder of what you’re doing and why. Objectively assess whether the progress being made aligns with the project’s overall strategy, its initial requirements and timelines, and recalibrate as necessary to keep things on track. Taking advantage of product development tools can also help you get a better grip on the intricacies and updates to projects and alleviate some headaches as well. Managing a complex development process while relying on a mix of constantly changing, mismatched set of emailed documents and spreadsheets as your source material can make the life of a product manager incredibly difficult. When facing dozens or even hundreds of milestones in a development project, it can get to the point where everything just sounds like white noise. That’s a good sign that it’s time to filter out what can wait and shift to the most important or achievable goals. Racking up small, daily victories creates momentum and chips away at what appears to be an otherwise insurmountable to-do list. You can also set yourself up for success by establishing more realistic achievements and tackling them early in service of broader, more ambitious ones. Part of this involves saying “no” to suggestions or additions that can induce scope creep and threaten to throw a project off track. A good product manager will build supportive teams that can adapt priorities as shifting project realities dictate. Sometimes that entails delegating responsibility down the chain, rather than the product manager’s natural tendency to want to take everything on themselves. By enlisting team members to handle certain responsibilities, you free your own mental bandwidth for big-picture tasks, and foster a sense of purpose and ownership among team members. Using development tools that facilitate real-time collaboration and transparency for tasks— especially as staff are heads-down on work and don’t have time to devote to lengthy meetings— can go along way in providing efficiency, visibility and accountability. Lastly, while it sounds cliché, being mindful of your physical and mental health really does translate to the quality of your work. This includes everything from taking simple breathing breaks to exercising and ensuring you’re sleeping enough. 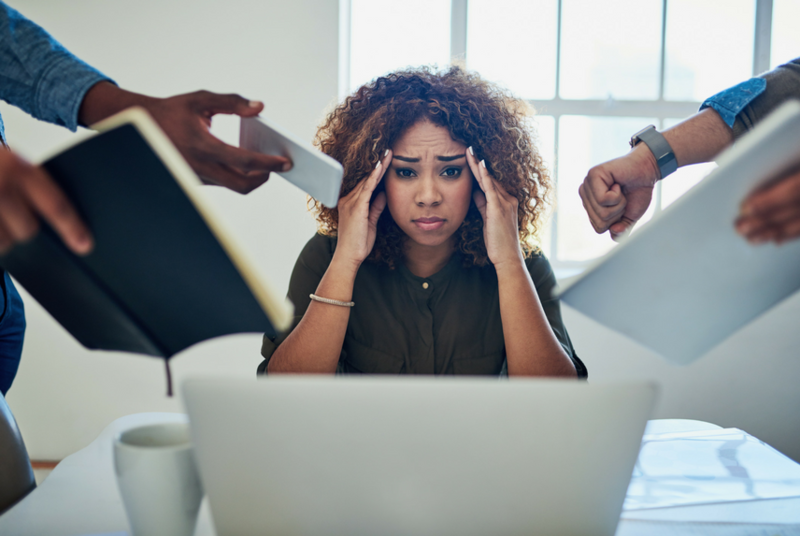 Knowing your body and mind’s warning signs of stress overload and listening to those signals can help you stave off exhaustion. Nothing grinds a development project to a halt faster than an absent product manager, and those who employ some of these strategies can blunt the impact of stress and greatly improve their odds of delivering career-defining finished products on time this year.